« I Declare……..I’m in lurrrrrrrrrrrrrrrve!!! Well Saturday evening was a blast, Tina and I decided we’d have a 2 layout deadline for the evening, and what the heck, chatter away while we worked, so by 2.30 am I finally had 2 layouts done. These are some of the files that I used in this layout, Elephant, Precious and Hearts Border. Click on the words to get the svg files for them. Okies Layout Number 2….suitably titled “Princess Diva” is all about Miss Ellen on xmas Day moments before she lapsed into a Diva Tirade, it was just precious NOT!!!!! 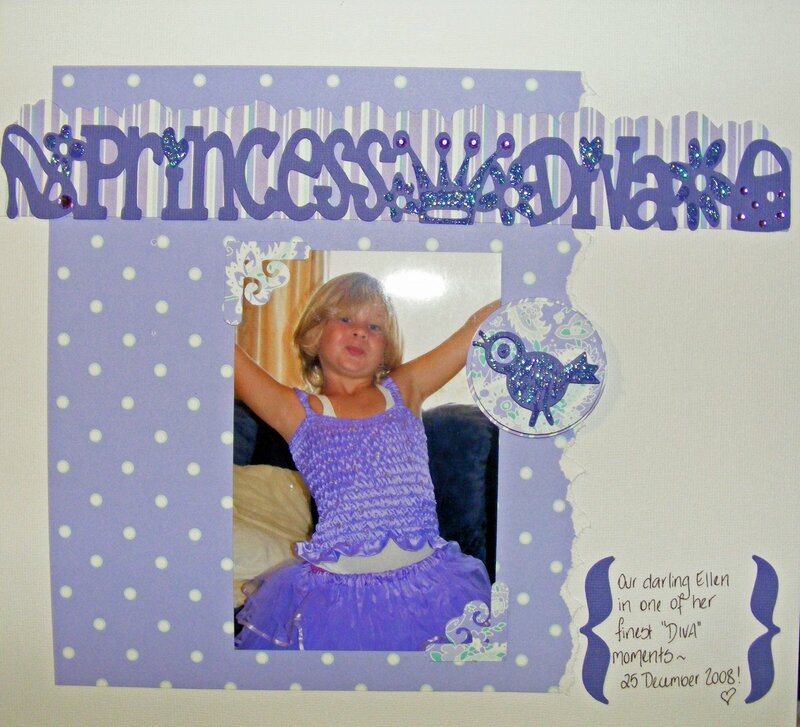 I have used a Princess Diva Border, basic circles, brackets, photo corner and the bird files on this layout. This entry was posted on February 1, 2009 at 5:30 am and is filed under Bird SVG, Elephant SVG, Hearts Border SVG, Parenthesis (Bracket) SVG, Photo Corner SVG, Precious Title SVG, Princess Diva Border SVG. You can follow any responses to this entry through the RSS 2.0 feed. You can leave a response, or trackback from your own site. Kris I love the layouts, given me some inspiration to continue my daughters pages. Kris, I love how cute your layouts are, and thank you for sharing your files. Too cute. Love your heart border. What beautiful layouts. You are a great designer of files – I am so jealous. I’ve decided I have to learn to use inkscape so I can start sharing. Thanks for sharing your creations.